ISLAMABAD: A delegation of Pakistan Tehreek-i-Insaf (PTI) called on Jamaat Islami (JI) Chief Sirajul Haq here, ARY News reported on Saturday. 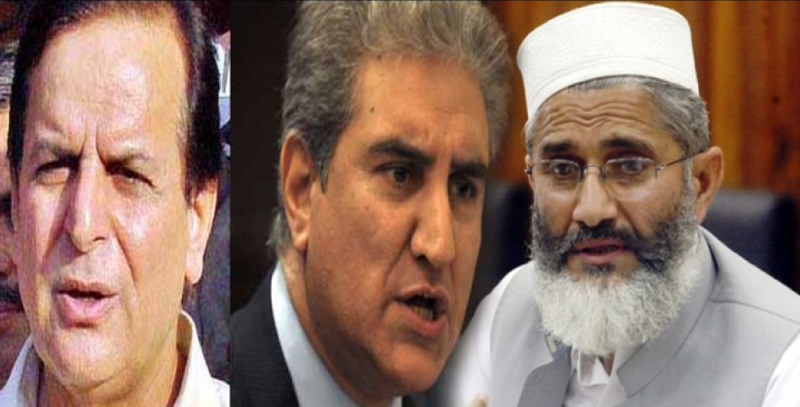 PTI leaders Shah Mehmood Qureshi, Pervez Khattak and Javed Hashmi met with Sirajul Haq to discuss the political situation. PTI had tendered resignations of its members of National Assembly on Friday. JI leader asked the PTI delegation to withdraw resignations of their lawmakers. He also urged for continuation of dialogue with the government of Prime Minister Nawaz Sharif over the PTI demands. PTI delegation briefed the JI emir about the details of the party’s negotiations with the government committee. The two sides also agreed to continue their coalition in Khyber Pakhtunkhwa province. The week-long standoff between the PML-N led federal government, Pakistan Tehreek-i-Insaf (PTI) and Pakistan Awami Tehreek (PAT) has triggered a situation of political uncertainty in the country.